Jerome a Paris (Jerome Guillet), who works in the investment side of the wind industry, has a lot of data on the "real costs" electricity generation. Paris does not suffer from the "nuclear derangement syndrome" so we get a fairly objective picture, which appears to be derived mainly from European data. "Paris" is not enchanted with Stormsmith, so we don't get any funny cooking of the books in our CO2 account. 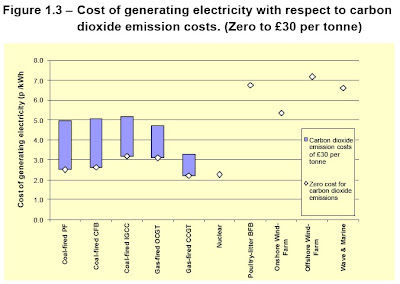 The Figure to the right is most illuminating because it shows that a carbon tax would leave nuclear power in a class by itself in terms of electrical generating costs.